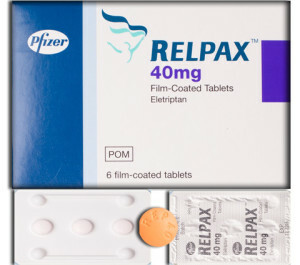 This medicine is a pain relief treatment, specifically intended for migraines. It is designed to be taken while a migraine is in progress, to help to soothe head pain and reduce associated symptoms. Straightforward Service The process was very straightforward. I simply completed an online form and was even able to consult with the staff regarding a question. I made my initial enquiry late on Monday afternoon and received my medications the following Wednesday by courier. The main ingredient in Relpax is an agent called eletriptan hydrobromide, also known as a tryptan. Migraine pain is typically caused by swollen and inflamed blood vessels around the brain. This medicine works by narrowing these blood vessels and stopping them from growing larger. It helps to reduce other migraine symptoms by stopping the body from releasing exacerbating chemicals. Because this medication is a powerful pain reliever and has a very specific use, you can buy Relpax online or in person only with a prescription. It is therefore essential to ensure when purchasing this medication that you do so from a website with a reliable consultation procedure in place. A doctor may not issue this treatment to persons who are allergic to any ingredients or suffer from certain medical conditions. Possible side effects include nausea and hypertension. The information provided here is not comprehensive. For a full list of side effects and restrictions, as well as what to do if you experience any side effects, consult the safety information leaflet provided. All products are delivered by tracked courier. If our pharmacy receives your order before 3pm on a weekday, they will ship the same day – meaning your treatment will be with you by the following working day. At all other times, your product will be delivered at the next available opportunity. We only ever ship using unmarked, secure packaging, for your privacy and safety. If you are looking for somewhere safe and legal to buy painkillers in the UK, you have come to the right place. After placing your order, you will be guided through our easy-to-use consultation process, where we will present you with a health questionnaire. A doctor will review your answers, and if they deem the treatment to be suitable for you, they will create an electronic prescription. This will then be sent to our UK-based pharmacy which will dispense your order.